Note: Our sanctuary campus list began in 2017. OJJPAC began tracking sanctuary campuses after it determined that such campuses might be subject to cuts in federal funding for failing to obey federal immigration laws. In 1996, the 104th U.S. Congress passed Pub. L. 104-208, also known as the Illegal Immigration Reform and Immigrant Responsibility Act (IIRIRA ). The IIRIRA requires local governments to cooperate with Department of Homeland Security's Immigration and Customs Enforcement (ICE) Agency. Despite the IIRIRA, many private and public colleges and universities have ignored the law and adopted so-called "sanctuary policies." Generally, sanctuary campus policies instruct college and university employees not to notify the federal government of the presence of illegal aliens enrolled or working in their educational institutions. These policies may also blur the legal distinction between foreign students with valid student visa's and aliens enrolled in these institutions but are in the U.S. illegally. Campus policies may provide illegal aliens access to the same taxpayer funded programs and benefits available to foreign students who have a valid student visa. Sanctuary campus policies exist in two forms, formal and informal (de facto). A formal sanctuary campus policy is a written policy enacted by the schools board of trustees or administrative action--general or special orders, or departmental policies. Formal campus sanctuary policies are the easiest to identify because these sanctuary policies are in writing and are subject to public records requests if the college or university is a public institution. An informal sanctuary policy is an 'unwritten' policy that exists but is not documented on paper. None-the-less, an informal campus sanctuary policy is sanctioned by a college or university President and or the schools board of trustees. The policy is then implemented by its employees (administrative, service, and or safety forces). Informal sanctuary policies are more difficult to document since no official public record exists. Informal sanctuary policies however can be evidenced in other ways. Statements and actions by a public university official can indicate a school's unwritten policy too. For example, a school president (e.g., college or university) gives a speech in support of a campus sanctuary policy can evidence an unwritten sanctuary policy. Does a public university police department contact Immigration and Customs enforcement (ICE) if they encounter an illegal aliens student after a campus traffic stop violation or theft of campus equipment? Are illegal aliens students simply released after the traffic stop or time spent in the local jail? Are criminal charges dropped to help the illegal alien student from being taken into custody by ICE? Do college or university administrators complain to the press that illegal aliens on campus should not be subject to raids or arrests by ICE? Do the trustees adopt a board resolution in opposition to the enforcement of U.S. immigration laws? Does the public university support in-state tuition discounts for illegal aliens enrolled at their school? These types of actions and statements are indicators that an informal (unwritten) sanctuary policy may exist at a college or university. Why do University officials adopt campus sanctuary policies? One justification of creating campus sanctuary policies is often under the guise of protecting 'immigrant rights.' But illegal aliens are not immigrants. By definition, an 'immigrant' is a foreign national (alien) who legally emigrated to the U.S. and has applied for and was granted lawful permanent resident status by the U.S. government. When a foreign national is illegally smuggled into the U.S. or violates visa restrictions, he or she is an unauthorized (illegal) alien present in the U.S. in violation of U.S. law, and subject to deportation under Title 8 of the U.S. Code § 1227, Deportable aliens. However, illegal alien students cannot possibly be victims of crime (or be witnesses to crimes) if they if are not in the U.S. Nor can illegal alien students, victimize U.S. citizens each year if they are removed from the U.S. and kept out by an aggressive border and interior enforcement policy. Logically, public safety is improved by enforcing immigration laws, including the prosecution of those individuals whom have aided and abetted illegal aliens. Why do school administrators and trustees support sanctuary campus policies? There are a variety of reasons. 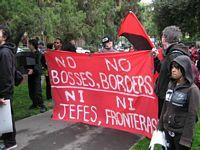 Some universities attempt to appease politically powerful illegal immigration support groups such as the National Council of La Raza (NCLR), Mexican American Legal Defense & Education Fund (MALDF), and League of United Latin American Citizens (LULAC) that lobby colleges and universities to implement formal or informal sanctuary policies. Other reasons include avoiding public protest pressure group tactics, and philosophical disagreement with existing U.S. immigration laws. A college president may support a campus sanctuary policy because they share a similar political ideology as the members on the school's board of trustees, or just want to keep their jobs. Supporting sanctuary policies can also be the path of least resistance too. College officials can avoid campus political protests and threats of discrimination lawsuits by organizations like the ACLU that might follow any attempts by university officials who try to prevent illegal aliens from enrolling in their schools. The consequences of campus sanctuary policies. What you can do. Sanctuaries for illegal aliens provide an important strategic advantage over federal law enforcement and their ability to perform their primary law enforcement duty--to protect U.S. citizens. Sanctuary policies, official or de facto, result in safe havens (or safer havens) for illegal aliens involved in a variety of criminal enterprises. All sanctuary policies inhibit the ability of law enforcement officers to accurately identify foreign nationals which makes it more difficult to uncover their illegal activities. Illegal aliens face less risk of deportation too if they are protected by university police departments. Sanctuary policies also help shield the operations of Latin American drug cartels, gangs, and terrorist cells, since their activities are less likely to be detected and real identities uncovered by local, state, or federal law enforcement. Some universities that have campus sanctuary policies (e.g., The Ohio State University) even receive millions of dollars in state and federal funds. According to Rep. Duncan Hunter (R-CA), Congress should cut federal financial aid to schools that refuse to cooperate with federal authorities. Hunter has introduced the 'No Funding for Sanctuary Campuses Act,' which according to his press release, denies Title IV funding to sanctuary campuses. What you can do to stop campus sanctuary policies? What can you do to help stop campus sanctuary policies? Get involved and demand change! Call your local colleges and universities and tell them that if they adopt campus sanctuary policies, you will work to get their Title IV funding cut. If you are an alumni of a college or university that has a sanctuary policy or is considering adopting one, tell them that you will not only work to get their federal funding cut but also not contribute any funds to their endowment or capital campaigns. Some university officials have publicly opposed campus sanctuary policies. Pennsylvania State University's President Eric Barron refused to buckle under the pressure of pro-sanctuary student activists who had protested for a campus policy. Barron reportedly justified his refusal to consider adopting a campus sanctuary policy because he didn't believe Penn State had a legal right to ignore federal law. What may have helped Penn State decide not to adopt a sanctuary policy are two bills in the Pennsylvania state legislature that would cut millions in state funding from either sanctuary cities or sanctuary campuses in Pennsylvania. State Representative Jerry Knowles (R-PA) introduced the bill that would strip state funding for campuses that violate federal immigration laws. If any colleges or universities were stripped of their state and or federal funding because of their sanctuary policies, they would likely be subject to immediate legal challenges. Most educational institutions will likely fight to keep the millions in state and federal dollars flowing into their schools. As partisanship has been apparent in the battle over sanctuary city policies, the political tendencies and leanings of school presidents and trustees play a significant role in the campus sanctuary policy debate. Trump succeeded in riding the country's pro-immigration law enforcement wave all the way to the White House. President Trump's dramatic November 8th election victory stunned open-border advocates who vowed to fight any attempt by President Trump to enforce the rule of law and deport illegal aliens. Trump's vow to crack down on 'sanctuary cities' (or other political jurisdictions) by cutting their federal funding has also set the stage for a battle with many cities run by socialist Democrats who have openly stated that they will continue to defy federal law and aid illegal aliens by refusing to cooperate with federal authorities. During Trump's first week in office, the President signed several pro-immigration law enforcement Executive Orders. The 'enhancing Public Safety in the Interior of the United States' Executive Order dealt specifically with the problem of Sanctuary Cities. Does your city, county, or state have a written or unwritten sanctuary policy? First, read the disclaimer and then view the list of U.S. cities below. Note: This article was first written in 2006 by Steve Salvi, Founder, Ohio Jobs & Justice PAC. Steve's last revision was made on: February 16, 2017. If you believe a college or university should not be listed, please send an email to salvi@ojjpac.org. We will note the dispute and attempt to verify the school's status. Dates that accompany entries represent the point at which a school was added to the campus sanctuary list. Dates do not necessarily indicate when a campus became (or allegedly became) a sanctuary. Some sanctuary campuses may not have yet been identified and therefore not listed below. You are encouraged to perform additional research regarding the status of your campus' policies. The presence of illegal aliens on campus does not necessarily indicate that a school supports illegal migration or is a "sanctuary campus." Campuses that have rescind their sanctuary policies will be in green text. Campuses disputing listings will have a notation in red text.